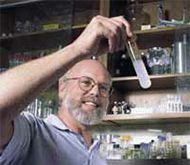 Bradley Tebo has been named a Fellow of the American Association for the Advancement of Science (AAAS) for his distinguished contributions to the microbiology, biogeochemistry, and mineralogy of manganese. CMOP is now accepting applications for the 2014 summer internship. 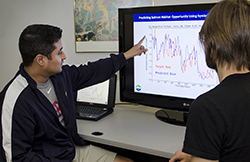 Summer interns are engaged in leading-edge research to understand and predict biological, chemical and physical processes of the river-to-ocean ecosystem. 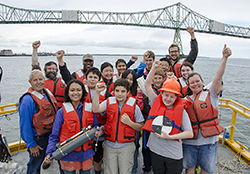 12 young scientists were part of a weeklong Oceanography Camp offered by the Center for Coastal Margin Observation & Prediction. 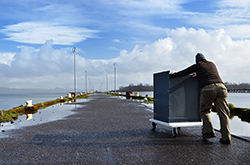 CMOP collects autonomous adaptive samples from microbial communities in the Columbia River estuary by integrating an Environmental Sample Processor with the SATURN Observation Network. 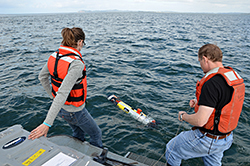 CMOP puts AUVs to work in a challenging environment to study how climate change and human stresses affect estuaries and nearby coastal waters. 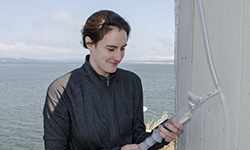 A Philanthropic Educational Organization scholarship supports Michelle Maier’s research into describing how environmental variables influence microscopic biological communities in river ecosystems. 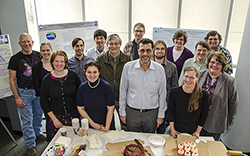 Nabil Abdel Jabbar spent his sabbatical at CMOP to better understand the computational models and observation network developed by the center. 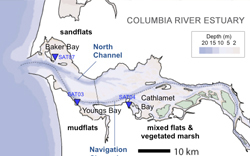 Scientists study the biogeochemical exchange between three bays and the Columbia River estuary to gain scientific insight of how metabolic processes affect the overall health of the estuarine ecosystem. OHSU's 2012 Technology Innovation Awards recognized the Software for Reduced-Dimension Data Assimilation system for its ability to use fast model surrogates to enable ensemble methods for data assimilation in very high-dimensional models like weather and oceanographic currents. 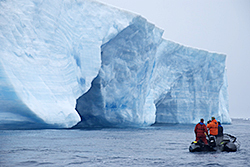 CMOP scientist and select group of students will participate on an Antarctic expedition to study the health of the environment.